For devices that don't meet your compliance policies or rules, you can add Actions for noncompliance. This feature configures a time-ordered sequence of actions, such as emailing the end user, and more. By default, when Intune detects a device that isn't compliant, Intune immediately marks the device as noncompliant. Azure Active Directory (AD) conditional access then blocks the device. When a device isn't compliant, action for noncompliance also gives you flexibility to decide what to do. For example, don't block the device immediately, and give the user a grace period to be compliant. Send email to end user: Customize an email notification before sending it to the end user. You can customize the recipients, subject, and message body, including company logo, and contact information. Additionally, Intune includes details about the noncompliant device in the email notification. Remotely lock the noncompliant device: For devices that are noncompliant, you can issue a remote lock. The user is then prompted for a PIN or password to unlock the device. More on the Remote Lock feature. Mark device non-compliant: Create a schedule (in number of days) after the device is marked not compliant. You can configure the action to take effect immediately, or give the user a grace period to be compliant. When using device compliance policies to block devices from corporate resources, Azure AD conditional access must be set up. 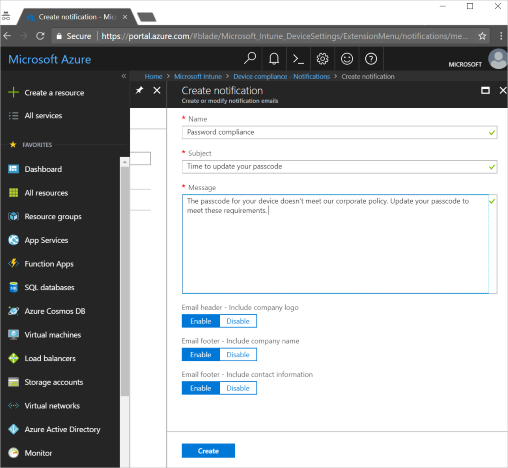 See Conditional access in Azure Active Directory or common ways to use conditional access with Intune for guidance. To send email to your users, create a notification message template. When a device is noncompliant, the details you enter in the template is shown in the email sent to your users. Select Device compliance > Notifications. Once you're done adding the information, choose Create. The Notification message template is ready to use. The logo you upload as part of the Company Portal branding is used for email templates. For more information about Company Portal branding, see Company identity branding customization. You can also change or update an existing notification template you previously created. When you create a device compliance policy, Intune automatically creates an action for noncompliance. If a device isn't meeting your compliance policy, this action marks the device as not compliant. You can customize how long the device is marked as not compliant. This action can't be removed. You can also add another action when you create a compliance policy, or update an existing policy. In the Azure portal, open Microsoft Intune > Device compliance. Select Policies, choose one of your policies, and then select Properties. Don't have a policy yet? Create an Android, iOS, Windows, or other platform policy. JAMF devices and devices targeted with device groups cannot receive compliance actions at this time. Select Actions for noncompliance > Add. Remotely lock the noncompliant device: When the device is noncompliant, lock the device. This action forces the user to enter a PIN or passcode to unlock the device. Retire the noncompliant device: When the device is noncompliant, remove all company data off the device and remove the device from Intune management. To prevent accidental wipe of a device, this action supports a minimum schedule of 30 days. Configure a Schedule: Enter the number of days (0 to 365) after noncompliance to trigger the action on users' devices. After this grace period, you can enforce a conditional access policy. If you enter 0 (zero) number of days, then conditional access takes effect immediately. For example, you can block access to corporate resources immediately if a device is noncompliant. When finished, select Add > OK to save your changes.